Incensed by the bloody crackdown that has claimed more than 500 lives, alleged Morsi loyalists orchestrated nationwide assaults on Christian targets Wednesday, wreaking havoc on churches, homes, and Christian-owned businesses throughout the country. 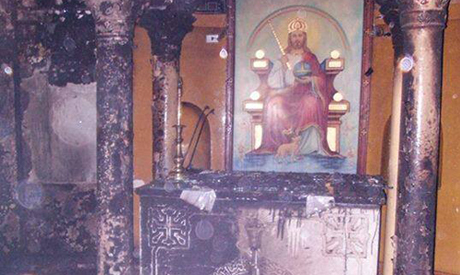 Coptic rights group the Maspero Youth Union (MYU) estimated that as many as 36 churches were "completely" devastated by fire across nine Egyptian governorates, including Minya, Sohag and Assiut — home to large Coptic communities. The group, alongside media reports, said that many other churches were looted or stormed in ensuing street violence Wednesday. Egypt's interior ministry told reporters in Cairo Wednesday that at least seven churches had been vandalised or torched by suspected Islamists. MYU spokesman Antwan Adel said at least two were confirmed dead — in the cities of Minya and Alexandria — during the anti-Coptic attacks. No independent confirmation of this tally has appeared. Adel blamed what he termed "criminal acts and terrorist perception" of the Muslim Brotherhood, the group from which deposed president Morsi hailed. "They seek to drive a wedge between Christians and Muslims," Adel told Ahram Online. "It's Christians in Egypt who pay the price to overthrow tyranny," Adel said, citing sectarian incidents under long-time strongman Hosni Mubarak through until now. Adel said his group had documented dozens of incidents of violence against monasteries, Coptic schools, Christian homes and shops in different parts of the country on Wednesday. The sectarian conflagration has set off fears of deeper polarisation and insecurity amongst Christians in a predominantly Sunni Muslim state. Coptic Christians — Egypt's largest minority — make up some 10 percent of the national population of 84 million. New York-based Human Rights Watch (HRW) said it had registered until late July at least six attacks on Christians across Egypt since the ouster of Morsi. The Upper Egypt governorate of Minya was scene of the lion's share of ًWednesday's attacks. The MYU put the number of churches assaulted in the city alone at 11, with some "completely burnt." Gebrial Dafshan of Minya's Christians Youth Centre (Al-Wady), which was stormed and engulfed by flames, blamed lax security on the part of the government at Coptic facilities. "There was no security presence. Even when we called the Fire Department for help they said they were themselves being attacked," Dafsahn said. Morsi's Islamist backers set dozens of police stations ablaze across Egypt and attempted to storm provincal governor offices following Wednesday bloody crackdown. A group of Morsi supporters also set fire to the finance ministry building in Cairo's Nasr City district, a few miles away from a main Cairo protest camp they manned for six weeks. Some Coptic Christians appear understanding of what they deem was "the inevitable" violence that would result from dealing with Islamist "terrorists." Yet critics say there should have been pre-emptive measures taken by both the army and police for what appeared to be a likely scenario of widespread chaos. Forty-one people were killed in Minya Wednesday in violence sparked by security forces storming pro-Morsi camps in Cairo, health ministry officials said. On Thursday, Egyptian authorities referred 84 people from the canal city of Suez — including members and supporters of the Muslim Brotherhood movement — to military prosecutors on charges of murder and burning churches, state news agency MENA reported. Egypt's interim premier, Hazem El-Beblawi, condemned the "criminal acts" against Copts in a telephone conversation with Coptic Pope Tawadros II, who threw his weight behind the army's ouster of Morsi on 3 July. El-Beblawi vowed to deal strictly with "terrorism," asserting that "unity between Muslims and Christians is a red line." Egypt's army chief General Abdel-Fattah El-Sisi pledged the military would cover the costs of restoration for all damaged churches. "We are outraged and deplore in the strongest terms the reprehensible attacks of the past few days against numerous Coptic churches," Psaki said during a Thursday press briefing. She, however, argues that state authorities are also blameworthy. "The government has a responsibility to create an atmosphere where Egyptians can exercise their universal rights, including free assembly, expression, and media." Egypt's health ministry said Thursday that some 525 people were killed and more than 3717 injured across Egypt on Wednesday, leaving the most populous Arab nation in ferment. The unrest led the interim government to declare a month-long state of emergency, with a daily curfew between 7:00pm and 6:00am in Cairo and 13 other governorates. Vice President Mohamed ElBaradei, a Nobel Prize laureate who gave his blessing to the ousting of Egypt's first freely elected president, resigned in protest at the use of force instead of pursuing a political resolution to the six-week stand-off between the army-installed government and the Muslim Brotherhood.